Paese Cosmetics Beauty Cream is a soft, smoothing foundation with a lightweight consistency. It ensures a natural effect of a perfect complexion for many hours. The main extract is Berry flux vita that has moisturizing properties and protects the skin from dehydration. It doesn't create a mask effect and makes the skin look luminous. The precise dropper ensures a comfortable application of the foundation. Additional Information: Introducing an award winning Polish cosmetic brand that opens a land of beauty for every women; age, color & skin. Paese Cosmetics introduces a wide range of high quality, trendy cosmetics that enhance your natural beauty. Explore the entire range of Foundation available on Nykaa. 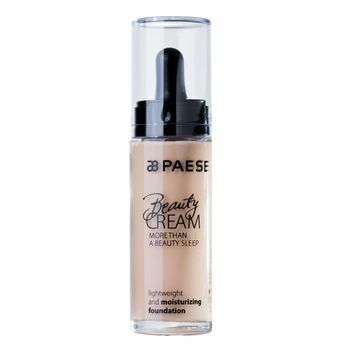 Shop more Paese Cosmetics products here.You can browse through the complete world of Paese Cosmetics Foundation .Alternatively, you can also find many more products from the Paese Cosmetics Beauty Cream Foundation range.